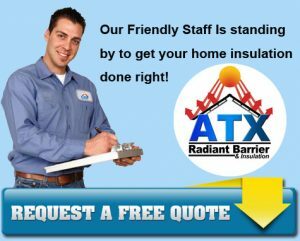 ATX Radiant Barrier & Insulation is a locally operated and family owned Austin insulation company. Serving our fellow Austin citizens for over 10 years now, we take pride in offering products and services that help property owners in Austin by helping create a more energy-efficient home or business. Our products and services help home owners and businesses save significantly on energy costs by lowering energy consumption. We have been in the energy conservation industry for over 40 years. We offer consultation services related to heating and air-conditioning. Our products and services are of top quality to ensure that you get only the best for your property. Our product line is comprised of American Made only products to insure the highest quality standards. If we wouldn’t have it in our house, why would we ask you to have it in yours? All members of our staff go through detailed training before we allow them on a clients property. In addition, all members of our team go through a background check and drug test to insure to our customers that we are sending the very best to you. ATX Radiant Barrier & Insulation offers turn-key solutions for all your requirements for insulation within and near the Austin area. We understand that looking for the right contractor to entrust your property to can be an extremely difficult undertaking. That’s where we come in to provide you with a painless and hassle-free process. Because we always have your best interest in mind, we are insured for your protection while at the same time providing you with a low price product and service guarantee. When it comes to making your home or business energy-efficient, trust the Austin insulation experts at ATX Radiant Barrier & Insulation. Take advantage of our FREE, no-obligation on-site assessment and estimates. Our team of estimators are highly trained to keep you best interest in mind. They will be in your property to provide you with some tips on making your home more energy-efficient. They will discuss your options and work with you and your budget to get the job done right. At ATX Radiant Barrier & Insulation, we place your family and best interest ahead of anything else. Our more than 40 years of experience in energy-efficiency makes us the contractor of choice for properties in Austin. Count on ATX Radiant Barrier & Insulation for the protection and efficiency your property deserves.